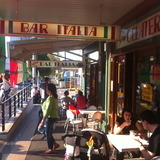 It is amazing (yet no surprise) that Bar Italia on Norton Street in Leichhardt is still around. I remember (and still treat myself to one occasionally) their fresh, home made gelato's. They are music to the lips of any food critic, ice cream fan, and to anyone who appreciates quality, fine food. Why not? Life is short. You need to eat in at this establishment to really appreciate their tangy, fresh gelato's. If I was lucky during my high school days at nearby Five Dock, I would be treated here occasionally to their gelato's. They were back then (and still are) flavoursome, refreshing and represent tremendous value for money. The serving sizes are extremely generous; you need to come here hungry (and more so on a hot day). However it is just as great to share with a close mate of yours - sharing is so caring in this case. Three scoops = heaven. The staff are so super fast and friendly and their approach is no-nonsense. You pay up-front at the counter with full table service. Not only do their gelato's pack some punch, their hot chocolate is also yummo. Remember to not mix hot and cold, so either go for the gelato or the hot chocolate depending on your mood. Seeing the hot chocolate made first hand, the milk is frothed with the chocolate already mixed in, and each sip is just heaven. I am not sure what type of chocolate powder or syrup etc they use but hey if it ain't broke, why fix it? Keep following that recipe because it works. The outside seats are the most coveted, even on the street front. Sitting inside is okay as well with that Italian homely feel, but the garden at the back is just terrific. Bar Italia is the perfect venue and locale to make magic happen.